The Good Daughter details a journey that most of us will travel as care givers or recipients of that care. In this case, an only child is responsible for a father with Alzheimer's and a demanding mother who competes for attention. Add to this a low-budget nursing home with one decrepit elevator, a staff as international as the daughter's foreign students, and residents that share their provocative questions with her. The daughter reverts to her childhood pattern of trying to please her perfectionist, self-centered mom while at the same time struggling to maintain her own family life and meet the needs of the ESL school she directs. Life and death decisions are interspersed with moments of joy and laughter provided by her job, her family, and her father's sparks of memory. When Mama shares secrets from the past, she opens the door to a better relationship through telling the rest of her life story. The result? 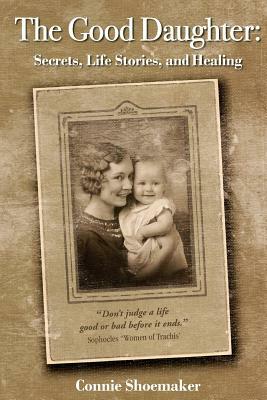 This book, a closer relationship with her daughter, and the daughter's growing understanding of her own life. Added Bonus: A Selection of Questions for Life Review and A Discussion Guide for Book Groups. Connie Shoemaker has focused much of her life on building bridges between cultures and generations. She encourages life story-telling in presentations and workshops, including facilitation of classes on "Telling and Writing Your Life Stories" for the Osher Life-Long Learning Institute (OLLI). As cp-founder and Director Emerita of Spring International Language Center, she continues her involvement with students from around the world. Connie lives in Littleton, Colorado with her husband and has three children and six grand-children.